On “Cold Feet,” John Thomson plays Pete, a loving husband, father and friend who has struggled mightily with mental health issues. Near the end of season six, it appeared that Pete was beginning to understand how to better manage his emotions, despite still being dissatisfied with his job as a taxi driver. Away from “Cold Feet,” however, it appears as if Thomson doesn’t mind driving others around. In fact, he seems to find so much joy in the task, it inspires him to enthusiastically sing some classic rock. Earlier this month, the UK’s Cheadle Hulme School held its annual Celebration Day for students. 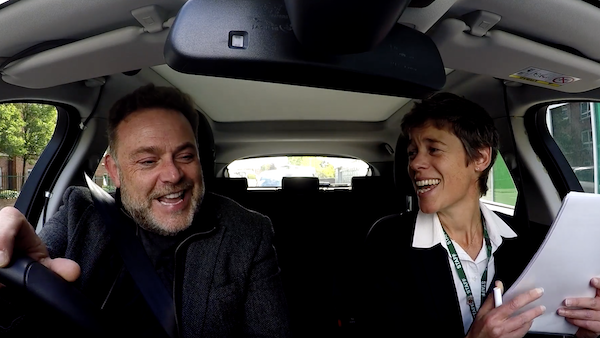 To add a little bit of extra flavour to it, Thomson appeared in a funny video with the private school’s headteacher, Lucy Pearson. The goal was to get Pearson to the school’s event at Bridgewater Hall – and, we suspect, to have her hit a few high notes along the way. As the two begin their trip, Thomson’s character tries hard to engage an otherwise preoccupied Pearson. He works hard at breaking the ice by trying to figure out what music she listens to. After guesses like Bonnie Tyler and Michael Buble fall flat, Pearson eventually notes her love for classical music. After considering Pearson’s revelation, Thomson has an idea: “Well this is an absolute classical,” he states before cranking up Survivor’s “Eye of the Tiger” on the radio. Without giving too much more away, let’s just say Pearson’s guard winds up going for a walk, and she ends up belting out the tune with Thomson. You can watch the hilarious results in the video below! Until the November 1 premiere of “Cold Feet” season seven, join VisionTV Wednesdays at 10pm ET/7pm PT for an encore presentation of “Cold Feet” season six. We’re celebrating the season seven premiere with your chance to win one (1) of three (3) copies of the book companion to the series, “Cold Feet: The Lost Years.” Click here to enter! This entry was posted in Articles and tagged British, Cold Feet, John Thomson, Music, Singing. Bookmark the permalink.